Our friends at Shinanoya are celebrating another milestone with yet another really special release. Their latest bottling is the 100th since they started their flagship “Chess” series, way back in October 2007. They're not scared of a bit of hard work there, that's for sure. 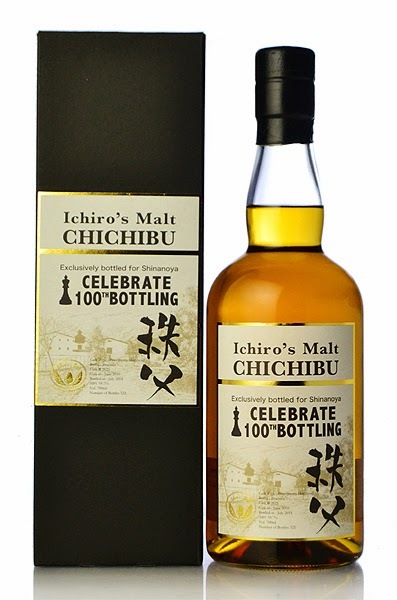 Their 100th bottling is a 4yo Chichibu. "So, what's new?" I hear you say. Well, what's new is that for the first time, we have a sherry-matured Chichibu: this single cask (#2625, 2010/2014) was drawn from a Fino sherry hogshead (bottled at cask strength, 59.7&abv). What a treat! Well, an online attempt was certainly impossible. Is anyone else finding the Japanese whisky scene more frustrating than fun these days? Apparently, it was sold out in less than 3 minutes... FB flooded by cries of desperation from people who had just missed out. That's what I mean, not very fun. In this climate I would recommend putting one' money in established labels that don't rely on hyperbole. Suntory won't let their Yamazaki 12 falter despite the current NAS trend. And I've been impressed with Nikka's (much older than labeled) Miyagikyo 12 or 15. I am a huge fan of the small producers popping up, but we need to concentrate on the quality of what's inside of the bottle, not just the label. As much as I love Chichibu and admire Ichiro, the prices are now getting a little out of hand. Please let me know how mamy bottles are online. I couldn't get online, but I walked into the shop in Kannai Yokohama on the 21st and managed to place an order for one. First I kept being told "sold out", but with a bit of insistence I eventually got presented a form to fill out. When I picked it up the next day there were 3 others in the basked for "reservations". My guess is that they only put a fraction of the 322 bottles online, to allow them to cater for other channels. As with other whiskies that are in high demand, it usually boils down to knowing someone in the right place... It's only natural that - when competition becomes so stiff - people flex their 'connections' muscles. On the other hand, your comment shows that with persistence it is possible to get your hands on a bottle too.